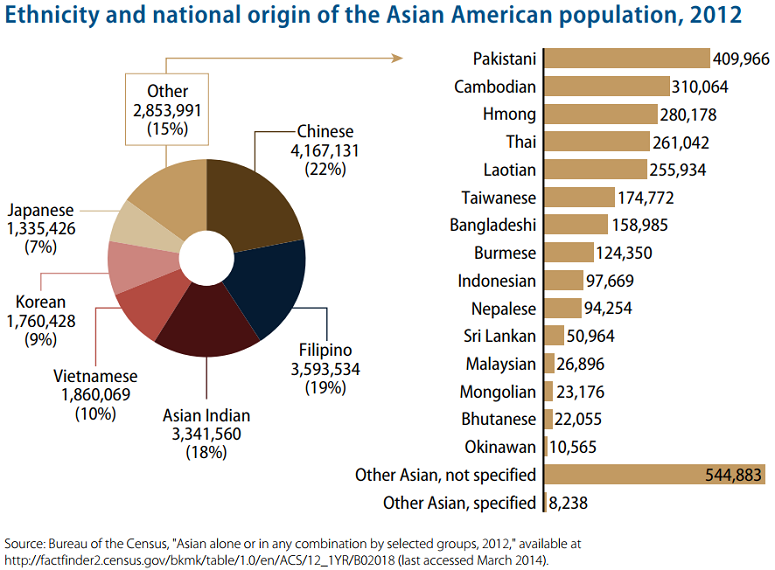 In the 2000 U.S. Census, the Federal Government defines “Asian American” to include persons having origins in any of the original peoples of the Far East, Southeast Asia, or the Indian subcontinent. “Native Hawaiian and Other Pacific Islander” includes Native Hawaiian, Samoan, Guamanian or Chamorro, Fijian, Tongan, or Marshallese peoples and encompasses the people within the United States jurisdictions of Melanesia, Micronesia and Polynesia. The previous “Asian and Pacific Islander” (API) category was separated into “Asian Americans” and “Native Hawaiians and Other Pacific Islanders” (NHOPI). Historically, Asians and Pacific Islanders were grouped together by government classifications and by us, as part of an intentional community-based strategy to build coalitions with one another. 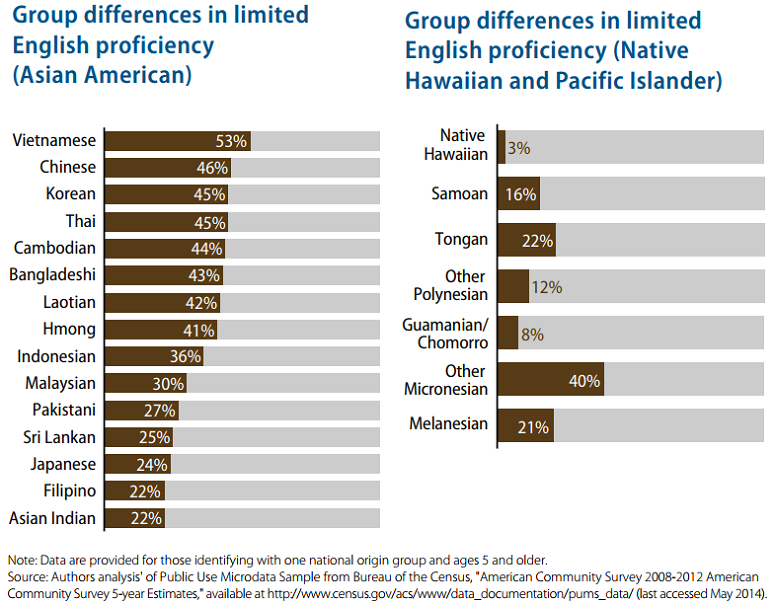 There are conflicting views on the appropriateness of any aggregate classification or reference – “Asian Pacific American”, “Asian American and Pacific Islander”, etc; and a lot of significance can get attached to them, e.g., the word “Other” in “Native Hawaiian and Other Pacific Islander” (NHOPI), and it is at times dropped in favor of “Native Hawaiian and Pacific Islander”. Whilst our communities use various names to describe themselves; these groupings are ultimately political and part of a dynamic, continuing process of self-determination and self-identification. We use the term “Asian and Pacific Islander” to include all people of Asian, Asian American or Pacific Islander ancestry who trace their origins to the countries, states, jurisdictions and/or the diasporic communities of these geographic regions. Practices: food, music, holidays, styles of dress, celebrations. There is no official definition of the boundary between Asia and Europe (nor between continents for that matter) so the boundaries are merely traditional – and some of the countries listed as Asian might not seem obvious. For example, Armenia, Azerbaijan and Georgia lie south of the Caucasus Mountains which have traditionally divided the two continents. Turkey and Russia straddle both Europe and Asia (sometimes referred to as Eurasia); 80% of the latter is in Asia, but Russians are generally considered Europeans; in the former, east of Istanbul is customarily considered in Asia. These examples illustrate why a single factor cannot be used to describe ethnic identity or origin. National Geographic lists the following countries in Asia: Afghanistan, Armenia, Azerbaijan, Bahrain, Bangladesh, Bhutan, Cambodia, China, Georgia, India, Indonesia, Iran, Iraq, Israel, Japan, Jordan, Kazakhstan, Kuwait, Kyrgyzstan, Laos, Lebanon, Malaysia, Maldives, Mongolia, Myanmar (Burma), Nepal, North Korea, Oman, Pakistan, Philippines, Qatar, Russia (parts in Europe and Asia), Saudi Arabia, Singapore, South Korea, Sri Lanka, Syria, Tajikistan, Thailand, Timor-Leste (East Timor), Turkey (parts in Europe and Asia), Turkmenistan, United Arab Emirates (UAE), Uzbekistan, Vietnam, and Yemen. Ethnic identities can be referenced in the aggregate e.g., Southeast Asians or disaggregated e.g., Cambodians. Asians and Pacific Islanders are generally grouped by regions although some of these can be politically controversial. There is tremendous diversity, with Asia having more than 40 countries, and there are more ethnicities than countries, e.g., the Hmong are an ethnic group from Laos. Also, Asian diasporas are extremely large and ethnic identity oversimplifications do not apply. For example, people of Japanese origin in Brazil culturally identify as Brazilians, those of Chinese origin in Guatemala identify as Guatemalans; whereas hyphenated identities are more common in the U.S. as evidenced by terms like Asian American, or Korean American. Notions of ethnic and national identity carry political, social and familial meanings too complex to analyze here. Central Asians Afghani, Armenian, Azerbaijani, Georgians, Kazakh, Kyrgyz, Mongolian, Tajik, Turkmen, Uzbek. East Asians Chinese, Japanese, Korean, Okinawan, Taiwanese, Tibetan. Native Hawaiians and Pacific Islanders (in the U.S. Jurisdictions & Territories) Carolinian, Chamorro, Chuukese, Fijian, Guamanian, Hawaiian, Kosraean, Marshallesse, Native Hawaiian, Niuean, Palauan, Pohnpeian, Samoan, Tokelauan, Tongan, Yapese. South Asians Bangladeshi, Bhutanese, Indian, Maldivians, Nepali, Pakistani, Sri Lankan. West Asians This is a contested term, most people from the region do not self-identify as such. West Asia is typically referred to as the Middle East; and geographically includes the countries of Bahrain, Iran, Iraq, Israel, Jordan, Kuwait, Lebanon, Oman, Palestine, Qatar, Saudi Arabia, Syria, Turkey (straddles Europe and Asia) United Arab Emirates and Yemen. According to the 2010 Census, the Asian American population in the United States grew 46% between 2000 and 2010, and 10% between 2010 and 2013, faster than any other racial group nationwide. Numbering only 6.9 million in 1990, there are over 19.4 million Asian Americans living in the United States as of 2013. States with highest number of Asian Americans include California, New York, Texas, New Jersey, and Hawai’i. States with the highest number of Native Hawaiians and Pacific Islanders include Hawaii, California, Washington, Texas, and Utah. 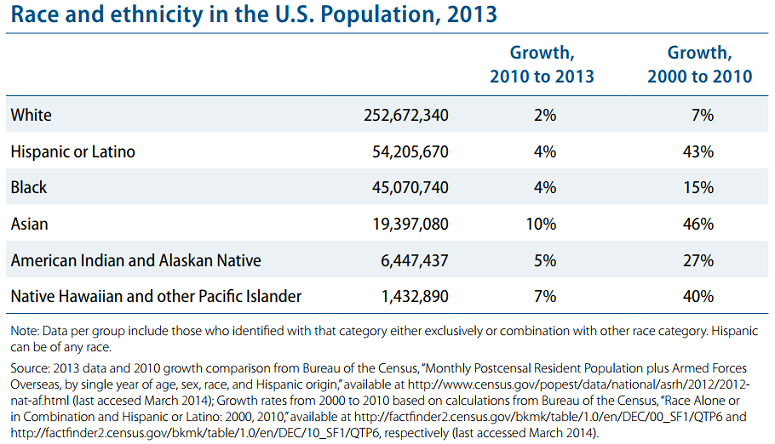 Hawai’i and California alone account for over half of the NHPI population in the U.S. The Asian American population grew the fastest in Nevada, Arizona, North Dakota, North Carolina, and Georgia. In these states, the Asian American population has more than doubled between 2002 and 2012. The Asian American population grew the slowest in the large states where the Asian American population had already been large. Chinese Americans continue to be the largest Asian American ethnic group, numbering 4.2 million nationwide in 2012. 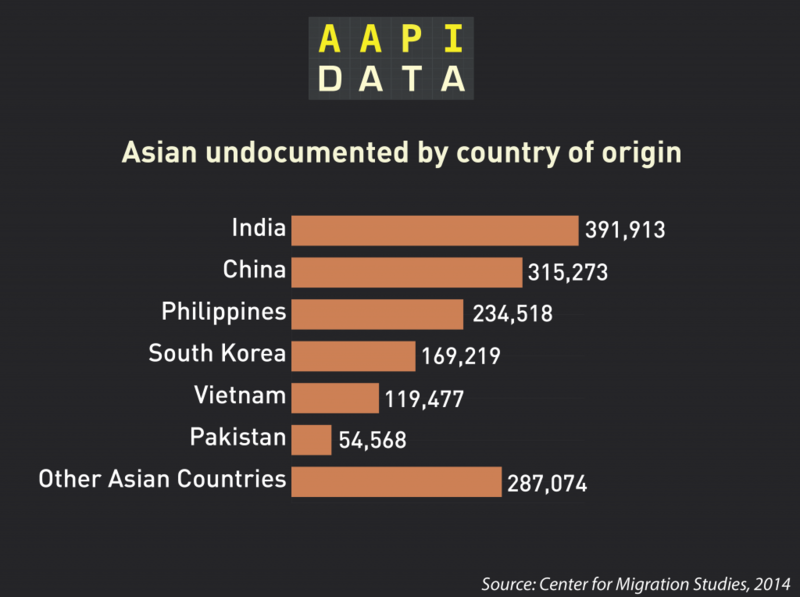 They are followed in size by Filipino(3.6 million), Indian (3.3 million), Vietnamese (1.9 million), and Korean Americans (1.8 million). From 2000 to 2012, the country’s fastest growing Asian American ethnic group is Indian, with a growth rate of 76%. 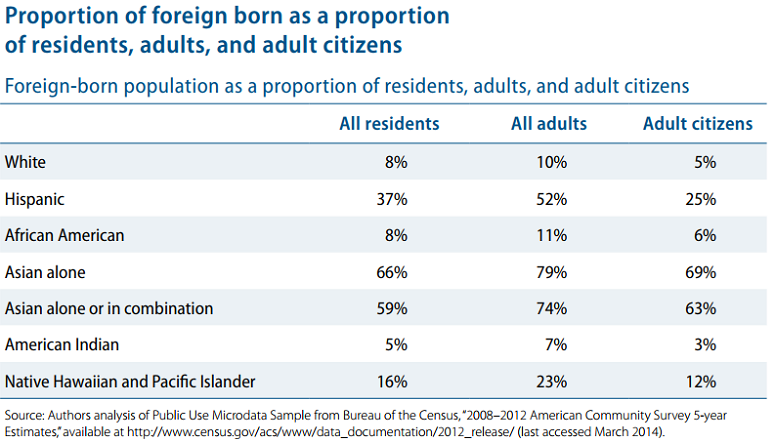 Approximately 66% of Asian Americans are foreign-born, the highest proportion of any racial group nationwide. In contrast, 37% of Hispanics; 16% of Native Hawaiian and Pacific Islanders (NHPIs), 8% of African Americans; and 8% of Whites are foreign born. 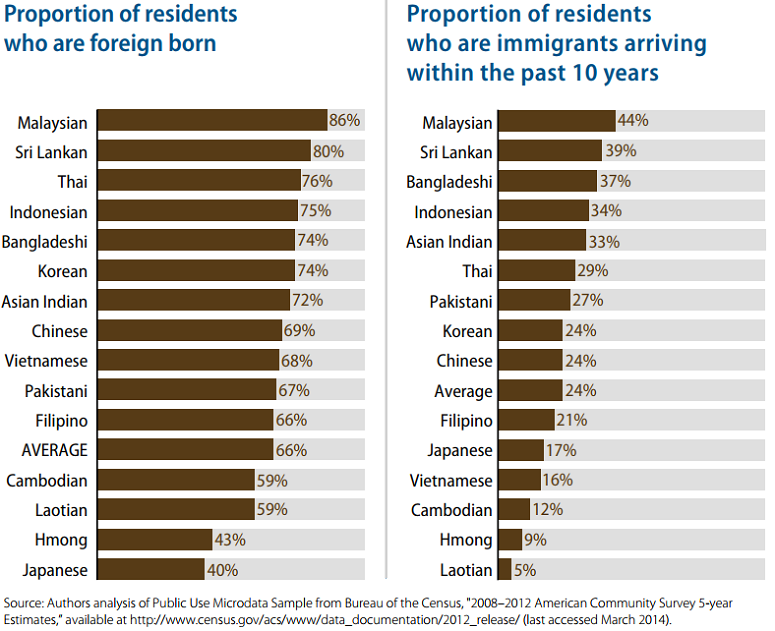 From 2008 to 2012, more than three out of four Malasian Americans were foreign-born, the highest rate among Asian American ethnic groups. Significant percentages of most South and East Asian Americans were also foreign born. Additionally, many of these immigrants entered the U.S. relatively recently, within the last 10 years. Refugees and Asylees are persons who came to the United States to escape persecution in their country of origin. Refugees are immigrants who applied for admission while living abroad, while asylees are immigrants who applied for admission at either a port of entry or within the United States. At 62%, those from Asian countries made up the largest group of all refugee arrivals to the U.S.
At 44%, those from Asian countries made up the largest group of all persons granted asylum in the U.S., whether affirmatively or defensively. At 26%, the largest group of refugees to the U.S. was from Burma. At 24%, the largest group of those granted asylum, whether affirmatively or defensively, was from China. Some immigrants from Asia come as legal immigrants, refugees, or asylees, while others enter without documentation or fall out of status due to the difficulty of obtaining a visa. How an individual enters the United States greatly affects her or his economic and social well-being in this country. 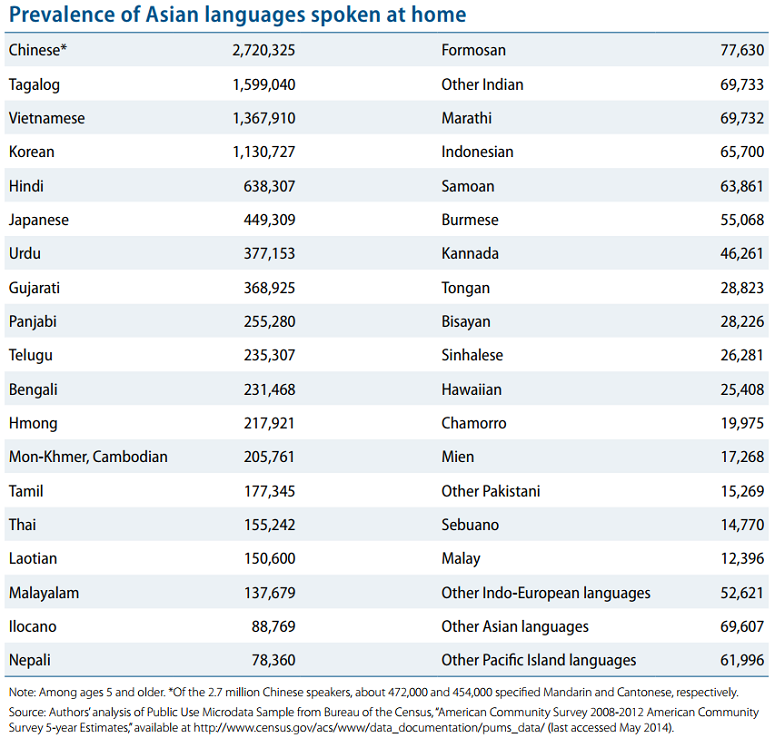 Approximately three quarters of Asian Americans speak a language other than English at home. 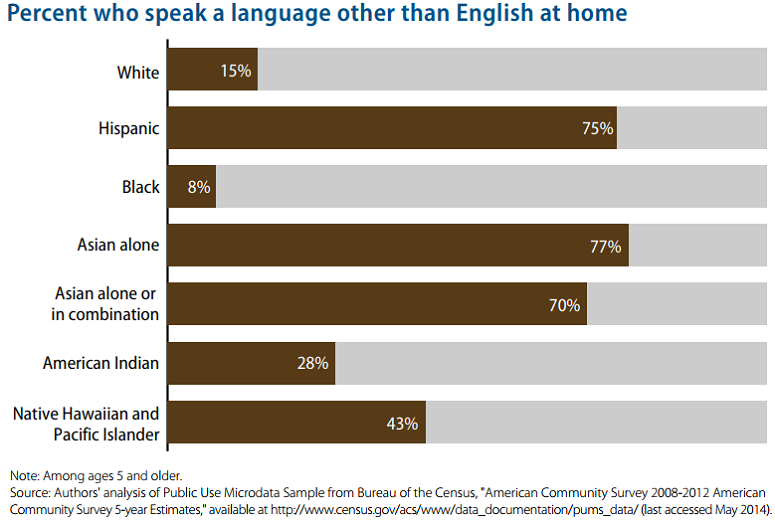 Roughly one-third of Asian Americans are limited-English proficient (LEP) and experience some difficulty communicating in English. Coupled with a lack of available English classes, language is a formidable barrier impacting access to a range of vital services, such as healthcare, social services, housing, courts, and education. Among Asian American ethnic groups, over half of Vietnamese and nearly half of Chinese, Korean, and Thai Americans are LEP. 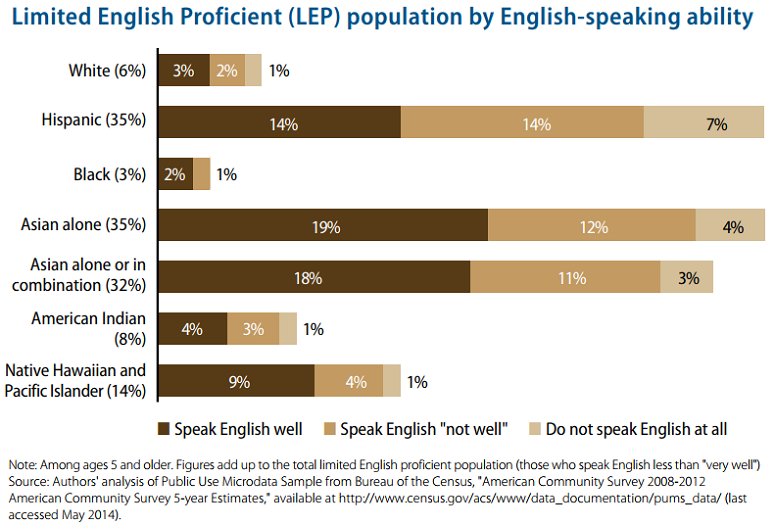 Over 40% of Cambodian, Bangladeshi, Laotian, and Hmong Americans are LEP. AAPI Data is a compilation of resources and infographics on topics affecting Asians and Pacific Islanders such as domestic violence, immigration, demographics, policy, and civic life. An overview of the geographical, historical, ethno-linguistic, and cultural diversity of Pacific Islander communities; historical trauma; and GBV trends. 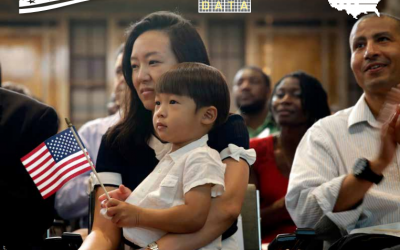 These factsheets provide a detailed look at 10 groups of Asian Americans by national origin, including data on educational attainment, income and poverty, civic participation, language diversity, immigration and nativity, labor-force participation, and access to health insurance. A series of reports providing insight and analysis along issue areas including: demographics, public opinion, immigration, education, language access and use, civic and political participation, income and poverty, labor market, consumer market and entrepreneurship, civil rights, health care, and health outcomes. Demographic information on Asian Americans including language fluency, educational attainment, economics, insurance coverage, and health concerns.